Somewhere in the middle of Idaho this weekend, I came upon a sign from above. Well not just somewhere, It’s on Highway 12 heading east to Lolo pass. 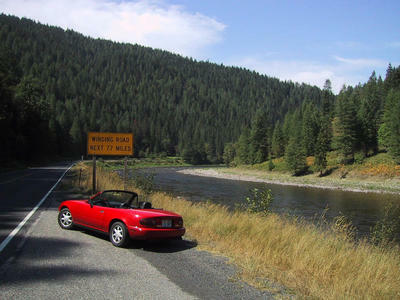 (From Lewiston Id to Missoula Mt.) And of those 77 miles of winding roads, there are no stoplights, or stop signs, cellphone towers, or billboards. For 65 miles, there are no services. And on Saturday, there were a total of 4 cars to pass, about one group every 20 miles. Once you cross Lolo pass, it’s just a few miles downhill into the Bitterroot Valley. I might also point out the speed limit on the Montana side is 70 mph on a 2 lane road.